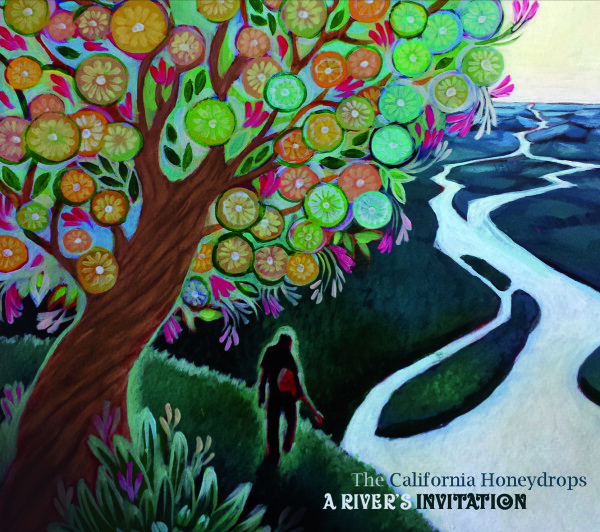 I recently fell madly in love with an album called A River’s Invitation by The California Honeydrops. 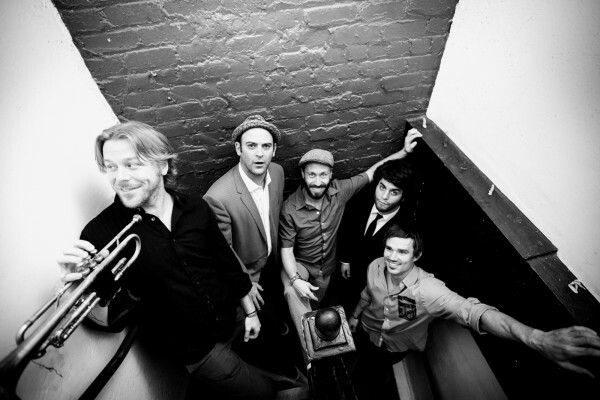 A band whose members play half the instruments under the sun, who call the Bay Area of San Francisco home, they blend everything from old jazz and pre-blues with New Orleans funk and classic R&B. In other words, there are elements of everything but the kitchen sink in their lush wall of sound and A River’s Invitation is a ripe and fruity album that’s equal parts cohesive and eclectic. In other words, it’s colorful, soulful and super cool. Right now you can catch the band opening for Bonnie Raitt most nights, though they’re still headlining some club dates on their nights off from her tour. I recently had a chat with frontman, guitarist and trumpet player Lech (pronounced Lesh) Wierzynski about the making of A River’s Invitation and the band’s tour with Bonnie Raitt. Unlike many lead singers with his amount of talent, I found him to be very down to earth and an all around nice guy. Suffice to say, I’m very much looking forward to seeing the Honeydrops live next week on the 29th when they play the Boston Orpheum with Raitt. But if you happen to be free on the 28th, you can catch them headlining at The Middle East in Cambridge, MA. MM: I understand you spent your childhood in Poland. How old were you when you left there? MM: How did you end up in the Bay Area? LW: I ended up in the Bay after I finished school at Oberlin and we went out there with the band and my girlfriend at the time, who was one of the co-founders of the Honeydrops. She has some family out there and we ended up in the Bay and we just started playing. We started playing on the street, mostly. And that’s kind of where this band was born out of me and her doing the street performance back in the day. MM: Did you guys meet at Oberlin then? LW: Three of us in the original band all had went to Oberlin at some point. Yeah. [Laughs] And, yeah, we just started playing out at the BART [commuter rail] stations. You know, the Bay Are awas significantly cheaper then, so we could pay our rent just kind of busking. MM: When you were doing that were you just jamming, or were you doing covers, or had you already started writing songs? LW: I had just started writing songs. I was very deep into old, old American music. So, I played a lot of Louis Armstrong stuff on the trumpet. And I also played guitar and she would play fiddle. And we had washboard and we would do like Mississippi Sheiks. Old school. Delta blues. And pre-blues music. You know, like, way, way back. Jugband tunes. Whatever. Even a little bit of old time Appalachian music, a little bit. We didn’t get too deep into that but we kind of loved and respected all of that stuff. We tried to do our best with it. 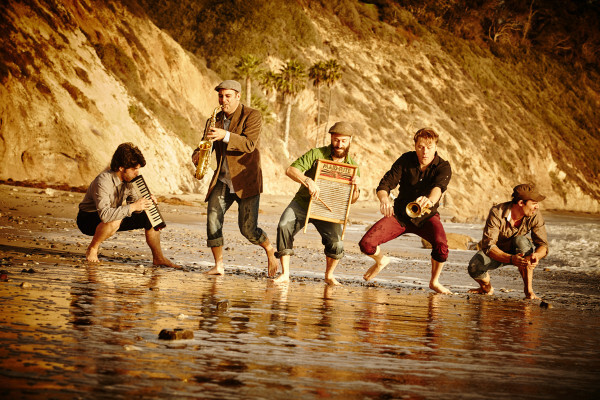 MM: At what point did you start calling yourselves The California Honeydrops? LW: That came later. That came probably about two, three, four years into my stay in the Bay. 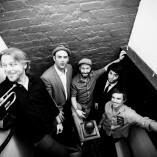 We became The Honeydrops. We named ourselves after the old band, The Tennessee Chocolate Drops. That was an old band from the twenties. And, yeah, that was how it all began. MM: You play guitar and trumpet. Did you take lessons for either of them? LW: Yeah, I took a lot of lessons for the trumpet. I studied. I started playing in school and I had a great teacher, whose name was Vince McCool and then I had another great teacher, Marcus Belgrave, who was a well-known jazz musician. Kind of like the jazz ambassador of Detroit for many years. He played with Ray Charles. He played with Charles Mingus. And he taught at Oberlin and so I studied with him. MM: At what point did you decide to make the first California Honeydrops album? LW: Well, actually, first we made a bootleg album that’s not available that we used to sell on the street. When we started we literally made an album on garage band. Recorded ourselves to have something to peddle on the street. So, that started right away. And then about a year after that we made a more proper album. Multitracked. But we still recorded it ourselves at the house. And that was our first record Soul Tub, which features the tub bass. There’s no actual string bass on that record. It’s all tub bass. And it just kind of featured our different musical interests and styles. Our first experiment recording. MM: How did you finance the new album? Do you have a label at this point or did you crowd fund it or…? LW: The last two albums ago we crowd funded it. And we did a Kickstarter. And that was the second to last album. The second album that we didn’t record at home, the place that we used to play threw us a fundraiser. We used to play a Wednesday pizza gig. And it was a cooperative. A pizza cooperative. Collective in Berkely. They actually threw us a fundraiser. They said, “Hey, we’re gonna open our doors on this day that we’re always usually closed and all you’ve gotta do is bring as many people threw that door as possible and we’ll give you all the profits.” And we did it. They really loved us. They came up to me one day and they were like, “ Hey, what’s it gonna take? Why are you guys still playing here?” And we were like, man, you know, we don’t have a record label or nothing. It’s hard out there. And they said, “Well, I’ll tell you what.” It was their idea. They came through with us for that. That recorded our album, Spreadin’ Honey. And then the next album that came out — the Like You Mean It record – was crowd funded through Kickstarter. And then the next album after that, this last one, we said to hell with all that, we’re not going back in the studio. That gets expensive. And we recorded it at home again. We recorded it in my living room. MM: I was going to ask about that because I did read that, but to me it sounds like one of the best produced albums of the year. LW: Oh, man. Well, I really appreciate that. We’ve been getting better at it. We’ve learned a lot over making the last five, six records we released. And we put a lot of time in. I really appreciate that. We’ve been trying to hone our chops on that. MM: From when to when was the new album, A River’s Invitation, recorded? LW: That’s a good question. I think we started it in the Spring of 2014. That was our first date. And then it was done by… We did little three day sessions because it was in my house and my house is tiny. So, we couldn’t do more than like a few days at a time or I’d start going crazy. So, we did a few three day sessions until the end of the year. Til about December. And that was it. Maybe November. MM: How does the songwriting process work for you? Are you the one who writes all the songs or do you co-write them with the band? LW: I write most of them. A lot of them kind of start out in my head or I write a lot of songs in my dreams. I kind of wake up with tunes. And then I hash them out. On this record, though, it was a little bit different because I wouldn’t work them out too much. I just had the real basic ideas. Then I would just bring them to the band. We kind of went with a go with the flow kind of approach to it. And we kind of worked it out together. People would start random stuff. Certain songs wouldn’t be working that we wanted to record. We’d just start jamming something else. A few them them just kind of sprung up out of some jams that we did in between takes. Because we were getting sick of the songs we were trying to record. There’s a few of my own little dream songs on there that I kind of just did myself. And there’s a bunch of stuff that we collaborated on, too. MM: Do you prefer writing and recording music or performing live? LW: I really, really must say I prefer performing live. The recording process can be tedious and perfectionistic and you get really far in your head. In a way that, luckily, the stage doesn’t allow you. You just go with the flow and if you make a mistake then you move on and no one even notices sometimes. So, recording is hard. But it’s also rewarding. And I actually do feel like I’ve got a mind for it in a way and I love producing the records. And I’ve gotten better at it. But I can’t say I enjoy it. It’s just after three days locked up in the studio I start losing my damn mind. Get me outta here, please. MM: You’re on tour with Bonnie Raitt right now, but I understand you recently did a streak of 28 sold out shows of your own. What are the advantages to being her opening act as opposed to headlining? LW: It’s been good for us. She is exposing us to so many fans. And we get to watch her every night and hang out with her musicians, who are all great, amazing players and fun people. And she’s still at the top of her game. So, it’s pretty amazing. This is a learning experience and an exposure experience for us as a band, you know? So, it’s great. Our solo shows, the main thing that I like about that is that I get to play for as long as I feel like it. With her, we’ve got our 45 minutes, which is in itself very gracious of her to even bring us along. She doesn’t need an opening act at all. And she’s a very sweet, sweet lady. She’s a great artist. It’s really a big honor for us. But we have been [headlining] on our nights off from her. We have been going out and playing three hours straight just to let loose a little bit. MM: I’m seeing you open for Bonnie on the 29th at the Boston Orpheum, but I read that you’re playing Cambridge, MA, on the 28th. So, that’s a headliner show in Cambridge? LW: Yeah. And we’re just gonna blow it out. MM: Do you have any particular memories of Boston? Have you been here before? LW: We’ve been once only. So, we don’t know a lot about Boston. So, we’re gonna get to know you guys a little bit better. We played there once before and it was a fun show. We’re definitely looking forward to coming back again. It’s a part of the country that we haven’t gotten to hit that often. It’s very far from California. MM: I know you don’t make set lists and ask for requests. Do people request a lot of covers then if they don’t know your songs? How does that work? LW: I mean, most of the people coming to our shows know the band and the songs we play. It’s not like they say “Mustang Sally” and we say OK. It’s not quite like that. They’re mostly the songs that we know. It just keeps it fun and fresh for us. And it keeps it interactive. It keeps the audience involved. That’s something that we really aim to do. That’s one of the reasons why we do that. So, that we can stay in touch with what’s actually going on in the room instead of just trying to nail a perfect set or something. That’s what makes it interesting to me. Every night is different. Every crowd has different energy. And you’ve just gotta roll with whatever that is. MM: How many dates are you doing with Bonnie Raitt? LW: I don’t know the precise number of shows. We’re going out with her for about two months. Thanks to Lech for taking the time to do this interview! Thanks also to Nick Mallchok at Sacks & Co. for setting it up! I do believe I saw these guys busking one time. Very lively bunch.